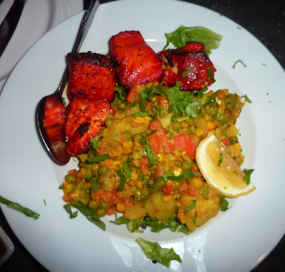 It’s been a few days since my last visit to Radhika Modern Indian restaurant in South Pasadena, but the flavors remain firmly in my mind (the heat from a couple of these dishes disappeared about 24 hours ago). 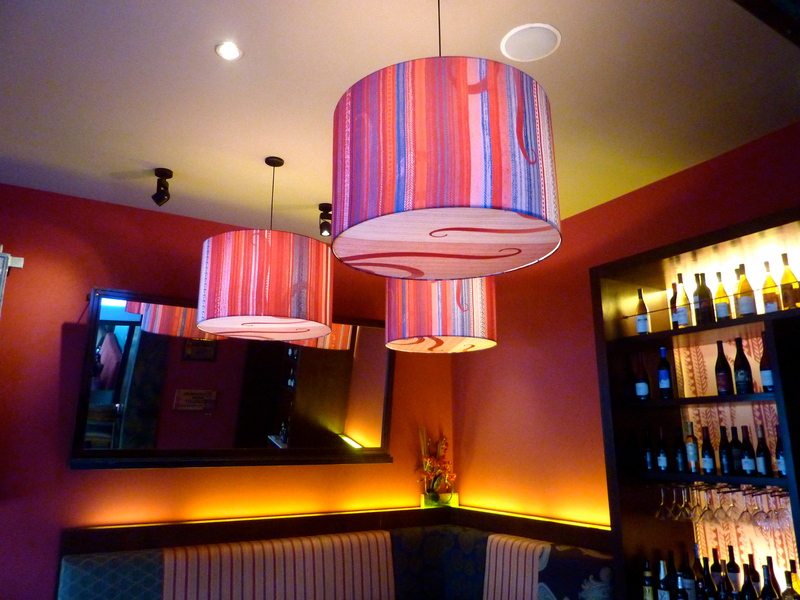 Until a week ago I had never heard of this establishment, but thanks to an invitation from friends to dine last Friday at this Indian restaurant that originated in Alhambra, we decided to make an encore appearance a few days later. Yeah, the food is that good! 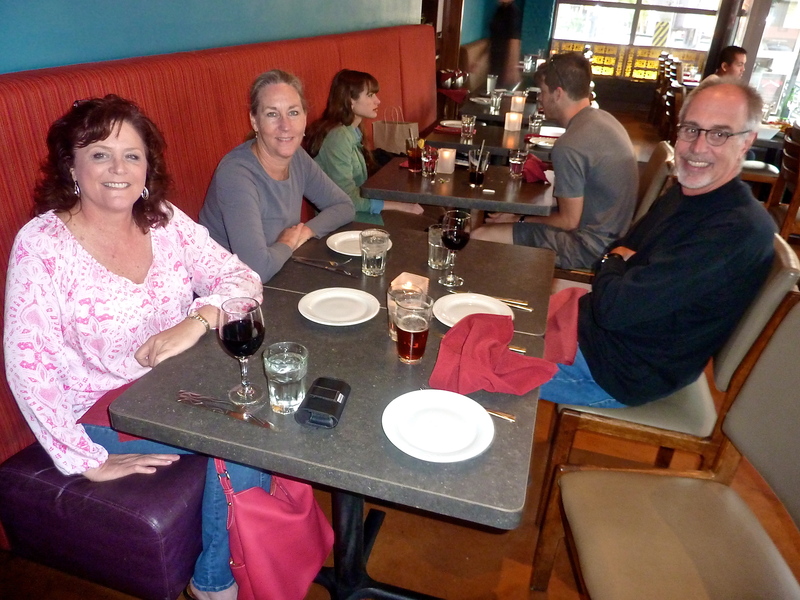 Our friends Paul and Susan, who usually have great restaurant suggestions, joined Tracy and me on a Friday night. 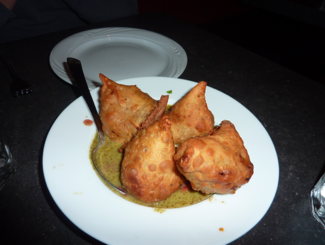 They had visited Radhika Modern Indian on a few occasions, so we let them choose their favorite dishes, while we picked out one (we shared them all). First up was a very filling (and delicious) appetizer, Goat Cheese Potatoes Samosa, Crisp Turnovers stuffed with flavored Goat Cheese, Spiced Potatoes and Peas ($6). 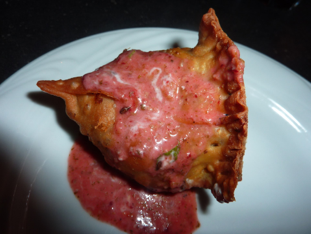 We each had one, and although I usually have an aversion to anything that contains peas, this appetizer (with a secret sauce drizzled on top) was incredible, but very, very filling. I thought I might not even be able to eat any of the main courses. Of course, I was dead wrong as usual. The parade of main dishes then started to arrive at the table, and it was time to dig in. 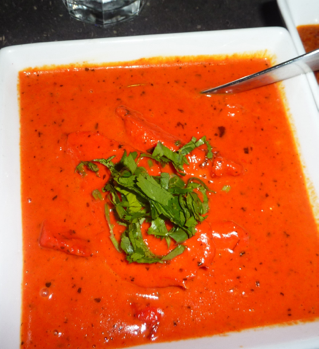 First up was Chicken Tikka Masala, Boneless Chicken Breast marinated in Yoghurt and Tandoori Spices cooked in the Clay Oven then simmered in Tomato Basil Sauce ($13). Quite simply a marvelous choice by Susan and Paul, and we were on our way to a culinary heavenly evening. 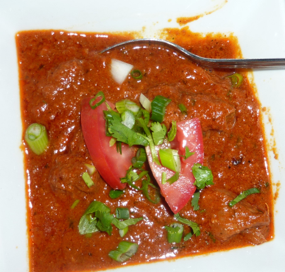 I had ordered the Roganjosh, Kashmiri style Lamb Curry ($14), which the menu said was “a classic Chef’s creation.” The tender lamb “creation” did not disappoint. 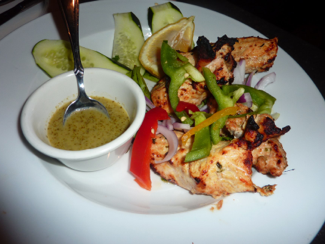 A really great dish came out next; Basil Chicken Tikka, Boneless Chicken Breast simmered in Basil and Yoghurt Marinade and cooked in a Clay Oven ($14). Tracy and I enjoyed this choice the most. The final meal that came out, Salmon Kabob, Fresh Salmon marinated with Herbs and Spices and Cooked in a Clay Oven with Pan Fried Fresh Vegetables ($16) was, in Tracy’s opinion (I was too full by now), the weakest of the dishes. “Too dry,” she said. 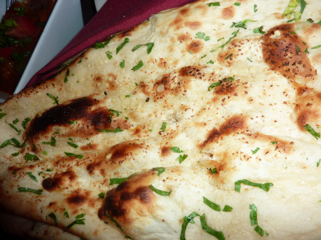 To accompany our choices, we ordered the three-pack Naan Bread Basket: Garlic, Basil & Rosemary, and Onion Naan ($8). This bread is truly addictive. Order at your own risk. 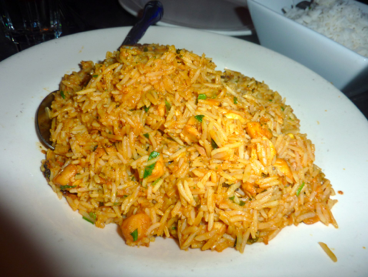 We also had one serving of Basmati Rice ($4), which was plenty for the four of us. Paul and I each downed a glass of beer ($6 each), while Tracy had a glass of wine ($7). The entire bill (with tip) came to $63 a couple. Well, we liked Radhika Modern Indian so much that a few days later when our friends Kim and Mary came up from San Diego, we visited again. 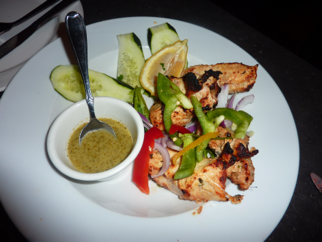 Once again we had the Basil Chicken Tikka, Boneless Chicken Breast simmered in Basil and Yoghurt Marinade and cooked in a Clay Oven ($14). Once again…delicious! Our fish connoisseur, Mary, decided to go for the Seafood Paella, Flavored Basmati Rice cooked with Seafood, Mint Curry Leaves, Garlic, Ginger, Kashmin Chilies, Red Onions and Tomatoes ($14). It tasted as good as it looks above. 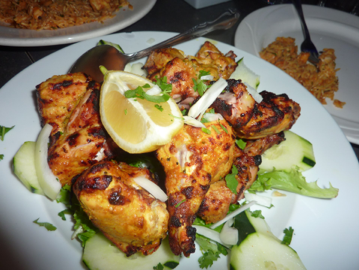 Our next meal up was the 1/2 order of Tandoori Chicken, Traditional Chicken marinated then cooked in the Clay Oven ($10). Not surprisingly, this was another winner. Finally, some like it hot, and tonight that someone was me. 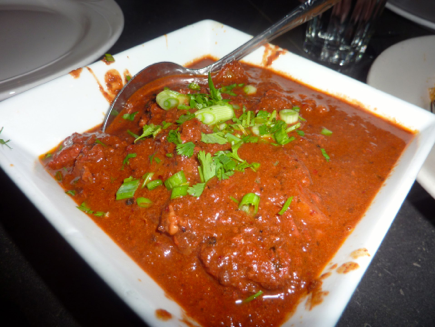 Lamb Vindaloo, cooked in a classic Fiery Red Curry Sauce ($14) was as tasty as it was hot. Thank God for beer! Obviously, Radhika Modern Indian is now another restaurant on our “Go To” choice list. 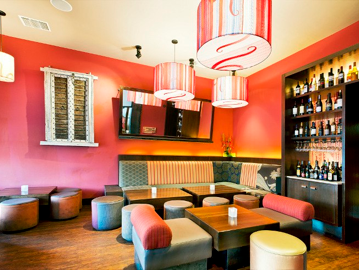 Great food, reasonable prices, nice ambiance and pleasant service have made Radhika Modern Indian one of our new favorite dining experiences (photo below from their website).